1) Your water becomes instantly absorbed by your body without the need for your body to "digest" it first and then it tastes great too and feels even better. 2) The VWR increases the amount of dissolved oxygen in your water towards its natural level. 3) The VWR eliminates and prevents slimy bacteria build-up. The instant absorption of revitalized water into your body gives you new energy and improves the digestive system resulting in better elimination of bodily waste. Revitalized water efficiently transports nutrients to the body's cells and transports waste products and toxins out of the cells. Test has shown the amount of dissolved oxygen in e.g. well water was increased by up to 25%. The Vortex Water Revitalizer naturally softens the water, eliminating or minimizing mineral and rust deposits in coffee makers, dishwashers, cookware and plumbing. It can even clean out existing mineral deposits (caused by hard water) in your pipes over time. Revitalized water does not slosh in your stomach! The Vortex Water Revitalizer improves the taste and smell of your tap water. Even the taste and smell of chlorine disappears quickly depending upon the amount. You can also store your revitalized water for many months, which is good if you are sailing or on holiday in your mobile home. It stays fresh, clear and tastes great. 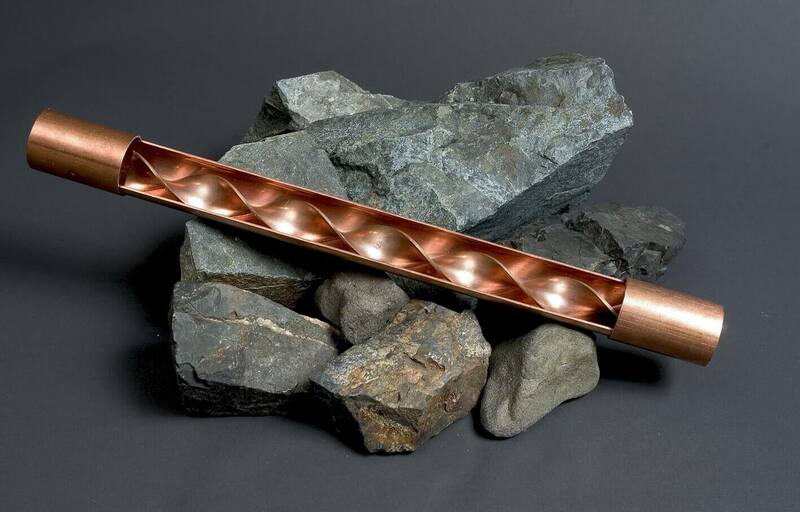 Below you can see the internal design of the Whole House Standard Vortex Water Revitalizer 3/4' diameter Copper. All of our models are using the same beautiful principles of vortex induced implosion. We cut the pipe in order to show you the inside. All models has this design internally. This is how the life forming energetic process of vortex induced implosion is facilitated by the Vortex Water Revitalizer! Click too see photos of all the models in our Shop Sections for Whole House Models ~ Apartment Models ~ Models for Filters ~ Commercial Models. The Vortex Water Revitalizer is based upon an evolutionary concept in Water Treatment. It performs far beyond what any filtration system, distiller or reverse osmosis system will ever do for you. It processes all your water in a direct way, leading it into a double helix DNA type cycloid, curved spiral flow-form, which creates a powerful vortex induced implosion in the water. The Vortex Water Revitalizer uses Mother Nature's proven methods of generating energy within the water via the process of vortex induced implosion. Implosion is part of Mother Nature's unique life forming energetic process. It is the opposite of the explosive principle, which we all know to cause heat, destruction, death and disease. By using the power of vortex induced implosion via flow dynamics, the Vortex Water Revitalizer transforms the water and restores its innate powers. The Vortex Water Revitalizer provides you with high quality water full of vitality. None of the filter/distillation systems or even bottled water can offer anything like it. It is also known as 'Living Water' and is the basis of all life in our world. Because revitalized water from the Vortex Water Revitalizer is so easily absorbed by the body, it feels as if it disappears while drinking. The designer of the Vortex Water Revitalizer models, Mikael Lund CEO of World Living Water Systems, was foremost inspired by Viktor Schauberger (30 June 1885 – 25 September 1958), an Austrian forester/forest warden, naturalist, inventor and philosopher, who wrote more than 60.000 pages in German about water, forestry, agriculture, energy production, infra-structure, social structure and socio- economics as well as future global weather changes, droughts, flooding and the general decline of the quality of life in the so-called civilized world! “THIS CIVILIZATION IS THE WORK OF MAN, WHO, HIGH-HANDEDLY AND IGNORANT OF THE TRUE WORKINGS OF NATURE, HAS CREATED A WORLD WITHOUT MEANING OR FOUNDATION, WHICH NOW THREATENS TO DESTROY HIM, FOR THROUGH HIS BEHAVIOUR AND HIS ACTIVITIES, HE, WHO SHOULD BE HER MASTER, HAS DISTURBED NATURE'S INHERENT UNITY." The author of this article is Callum Coats, who has given his permission to us, to post this wonderful article on our website as an introduction to the Vortex Water Revitalizer. As the foremost expert on the great works of Viktor Schauberger, Callum Coats has also written several books about Viktor Schauberger and his pioneering work, which you can find on amazon.com. The titles of some of his books are as follows: The Water Wizard - The Extraordinary Properties of Water [Volume 1] Viktor Schauberger - (1998) - 256 pp. 33 illus. Nature as Teacher - New Principles in the Workings of Nature [Volume 2] Viktor Schauberger - (1998) - 192 pp. 9 illus. The Fertile Earth - Nature's Energies in Agriculture, Soil and Forestry [Volume 3] Viktor Schauberger (2000) 220 pp. 16 illus. The Energy Evolution - Harnessing Free Energy from Nature [Volume 4] Viktor Schauberger (2000) - 278 pp. 61 illus. Living Energies - Viktor Schauberger's brilliant work with Natural Energies Explained Callum Coats, (1996) - 5th printing - 320 pp. 218 illus. Viktor Schauberger's body of work, was my original inspiration for my work with water revitalization and in developing the design of the Vortex Water Revitalizer and its many applications throughout society. The Extraordinary Nature of Water Based on the theories of Viktor Schauberger as interpreted by Callum Coats parts 1-6 , Each segment is 10 minutes for a total of one hour. Viktor Schauberger (1885 to 1958) made a lifelong study of water, from mountain springs to river flows and highly evolved hydraulics. He earned the name "Water Wizard" by developing a deep understanding of water ... the most important life-giving and energy empowered substance on the planet. Documentary Film: 'Water - the Great Mystery', a fantastic movie with several leading edge scientists explaining the facts about water as the elixir of Life. You can watch a trailer here: http://topdocumentaryfilms.com/water-great-mystery/ and if you like it, it is for sale on Amazon.com You can also google 'Water - the Great Mystery' and see if you can find a free youtube video; but they are taken down fast due to copyright claims. World Living Water Systems Ltd. is Accepting New Distributors. At World Living Water Systems we are working towards improving the world one Vortex Water Revitalizer at a time. We would like to share with you a way to be a part of this blue-wave. You will be rewarded for your efforts. Our profit-sharing program is amongst the easiest and most-rewarding in the industry and even across industries. We offer two ways to work with us; working with us DOES NOT have to cost you a penny. The two programs are the Affiliate program and the Distributorship program. If you wish to become a distributor or promote the Vortex Water Revitalizer in any other way, please contact us: https://www.alivewater.com/contact-world-living-water-systems or simply fill in the agreement below.